Exactly what Vettel meant is uncertain, but the world is going to interpret his comment as suggestive and demeaning. Earlier in the podium interviews, Vettel remarked that, “to have a woman on the podium, I think it’s not happening every day. Gill Jones, she takes care of our electronics in the team… she looks after the boys.” The suggestion that women have a place in F1 only in support of the men is unlikely to make Vettel any friends, both within and outside of the sport. In the wake of recent sugestions by Sir Stirling Moss that women lack the mental aptitude to race in Formula One, Vettel’s comments are likely to get much more attention than they perhaps deserve. He is in a sport that needs a radical rethink regarding its approach to gender equality, and has not helped an already sensitive situation by publicly putting his foot in his mouth. 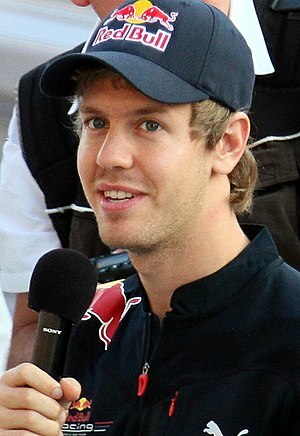 Oh no, shut your pie hole vettel! Yeah, he revealed his immaturity and social perspective. I’m wondering where he obtained such an attitude? Germany, family, racing? Idiot. Classic too much too soon. He needs to grow up a fast as he drives.